The Essensys Credits system allows you to sell credit packages to customers, which they can use instead of cash when making purchases from your organization. This guide will take you through the process of configuring this feature within Operate. Credits are set up as a Product and are made available for purchase via the Point of Sale or online on the Portal; and can be part of Licences or Bookings. Credits can "expire" and be removed from the account; new credits being added as part of the new billing period. Credits can "roll" for a certain amount of time. You have the possibiliy to choose whether one or the other occurs, by configuring your Credit Packages according to your desired result. We will take you through this process below. If the credits are sold through the Point of Sale or the Portal, then these will last as long as their lifetime is set. Please read below to learn more about the Credit lifetime. Online Plans cannot be paid for using Credits, but Credit Packs can be included in an Online Plan as an addon. Please note that Meeting Credits Meeting Packages and discounts will not apply for customers paying with Credits. To ensure that your Account and Product records display Credits related information, please edit their page layouts as explained below. To edit the layout of your Account records, go to Settings > General > Customize > Accounts > Page Layouts and follow the instructions in Customizing Page Layouts in essensys Operate to edit the Account type page layout (Prospects and Brokers will not be using Credits). Add the following fields to the layout: 'No. Of Credits', 'Credits Used' and 'Credits Remaning'. To edit the layout of your Product records, go to Settings > General > Customize > Products > Page Layouts and edit all product type pages except for meeting rooms and desks according to the instructions provided in Customizing Page Layouts in essensys Operate. Add the following fields to the layout: 'Enable Credits' and 'No of Credits'. This will enable Operate to show these fields on Account and Product pages. You will need these fields to go through the steps below. Go to Settings > Integrations and install the Essensys Credits app by clicking the 'Install' button next to it, as shown below. Settings > Integrations and click 'Open' next to Essensys Credits. Settings > General > Credits > Essensys Credits. 'Configuration' - Here is where you can configure the general settings for the credits system. 'Credit Packages' - This is where you can create credit packages which will be made available for your customers to purchase. 'Products' - This tab shows you the products which can be purchased using credits. 'Client Types' - Here is where you can configure your existing client types to use either cash or credits. The Configuration tab allows you to make several high-level settings, which will apply throughout your credits system. Enable Essensys Credits - This will activate the credits system within your Operate account. Enable Low Limit Warning - When checked, this will send an email to the “Account Email Address” and make the Credit Low Limit field mandatory. Credit Low Limit - The value you enter into the field should be numerical - once a customer's credits hit this number or go below, they will receive a warning to their “Account Email Address”.. The "Edit Low Limit Template" hyperlink below this field points to the email template used when emailing customers who have reached or gone over their Credit Low Limit. Enable Off-Peak - When enabled, this will populate two number fields called “Morning Off Peak” and “Evening Off-Peak” which will set new prices for bookings that do not fall between the opening hours set via Space > Locations. 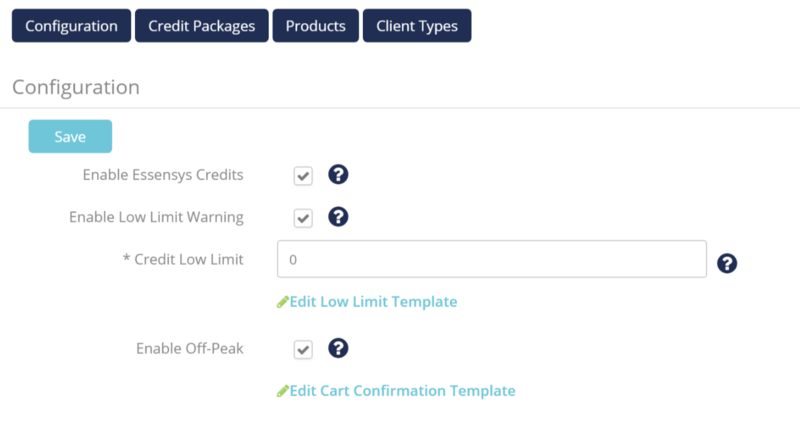 Edit cart confirmation template allows you to edit the confirmation email that gets sent when making a credit pack purchase on the Portal. This tab is used to easily create, edit and enable or disable credit packages. Credit packages are managed by Operate as Products; therefore this tab works in conjunction with the Products module. These credit packs will be available through the Point of Sale, as well as the Portal. This area will give the Operator control over which credit packs are available to be purchased at all times. You will now see the Product Types screen - Please select the Credit Pack type here. Please enter the required information for the Credit Pack, the same way you would for any other Product - for example: a name, product group, location, price, etc. The price of the product in this case will also be the purchasing price of the Credit Pack. Save your Credit Pack when you are ready. Note: We recommend that you create a "Credit Packs" product group, to help you manage them easier in the future. Learn more about working with Product Groups. Once created, Credit Packages will be displayed within the corresponding section of the Essensys Credits configuration area. You can edit any pack by clicking the pencil icon next to it, then making any changes you require, as explained above. This tab will show all the products that are included either within a “Catering Product Group” and/or “Facilities Product Group”, marked as such under Space - Product Groups. Please read more about Product Groups for further information. All products may be purchased using credits; however, different conditions apply for meeting rooms/desks and other products. All products except meeting rooms and desks. Enable Credits - Checking this field will allow purchasing the product using credits. No of Credits - This represents the price of the product, in credits. To sell a product as a credit product, you will need to check the “Enable Credits” field and add a credit price to the “No of Credits” field. When creating or editing meeting rooms and desks, first, the “Enable Credits” field must be checked. This will display two new fields in the Rates section of the meeting room or desk product record: the “Internal Credit Rate” and “External Credit Rate”. Given that on the Credits Configuration tab, the “Enable Off-Peak” field has been checked. then there will be two other fields as part of the rates, called “Morning Off Peak” and “Evening Off Peak”. Once the “Enable Off-Peak” field has been checked in the configuration, then these two fields will override the ‘hourly’, ‘half day’ and ‘day’ fields and will pull based off the hours set on the location. This tab displays all the client types and their associated organisation. 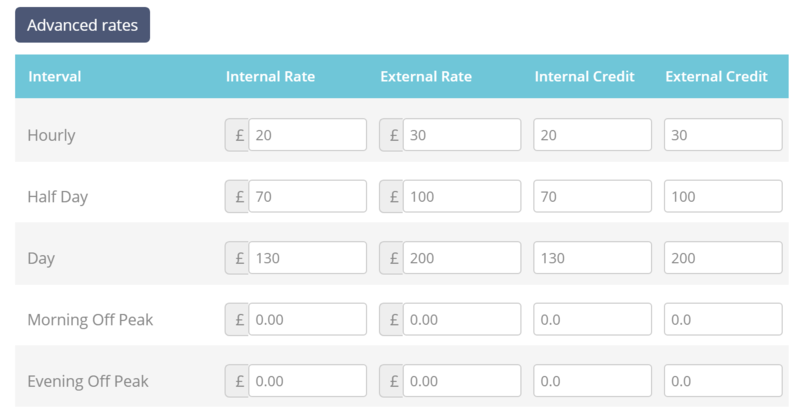 Here is where you can select whether the payment method for each client type should set to ‘cash’ or ‘credits’. Depending on what has been selected, this will pre-determine meeting room bookings to be displayed as either cash or credits within Operate and the Portal. If credits have been enabled and the client types have been configured to either cash or credit. then when making a booking within the Operate Calendar, as well as on the Portal, the client type will be picked up and will allow you or the customer to make the booking as either a cash or credit booking depending on the configuration. Any additional services that are added will either all be in cash or credits, dependant on the client type. So, if the client type's payment method is set to Cash, then the customer will be shown a price in cash. If the client type's payment method is set to Credits, then they will be shown a price in Credits, which will be subtracted from their Credit Package at the moment of payment. Please Note: Bookings will consume credits and invoice them within the month when the booking is supposed to occur, not the month when the booking record is created. For example, if a customer makes a booking in February for a future date in March, then they will consume and be invoiced for credits allocated for March. The Credit Packages you create will be made available as a Contract Service, which you can add to a Licence. Please see Creating a Licence and Adding a Service to a Licence, for information on how these features work. When creating or editing a Licence, click Add Contract Service and add a credit pack to the licence. First build a credit pack with a lifetime, as shown above. Pick the schedule for this credit pack (e.g. Monthly means that the customer will receive this credit amount every month; weekly means they will receive credits every week). They will receive the credits after the invoice has been approved. Therefore, for monthly packs, each month there will be an invoice which includes it all, while for weekly ones there will be 4 line items on the invoice, each charging for a week of credits. For example, if you want to assign 10 credits per month on a licence for 12 months, you will need to create a credit pack for 10 credits with a lifetime of 1 month. 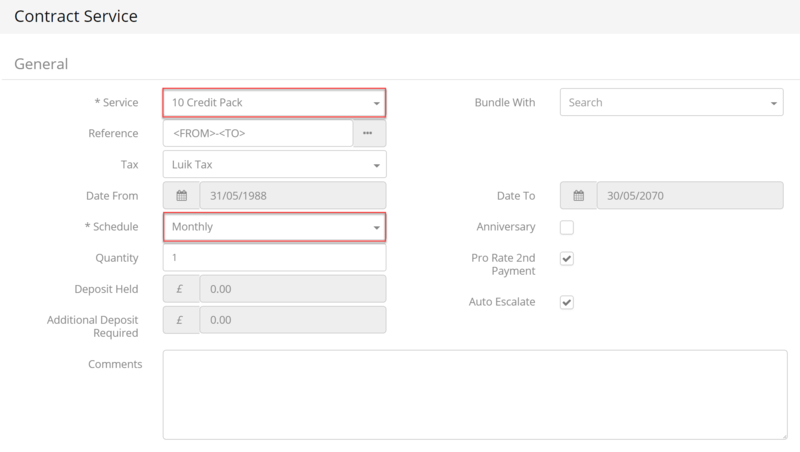 Then on Licence item, you will need to choose a monthly billing schedule, making sure that the From and To dates on the item are the ones within which you would like to provide credits. Build the credit pack to have the amount of credits you want to provide to the customer; as well as lifetime you need them to be valid for - for instance 10.000 credits for 12 months. When the invoice is approved, these credits will be assigned to the account with their lifetime of 12 months. You can configure Licence Credits either as rolling or as expiring. Rolling credits can continue to be used after the end of the billing period they were allocated for. 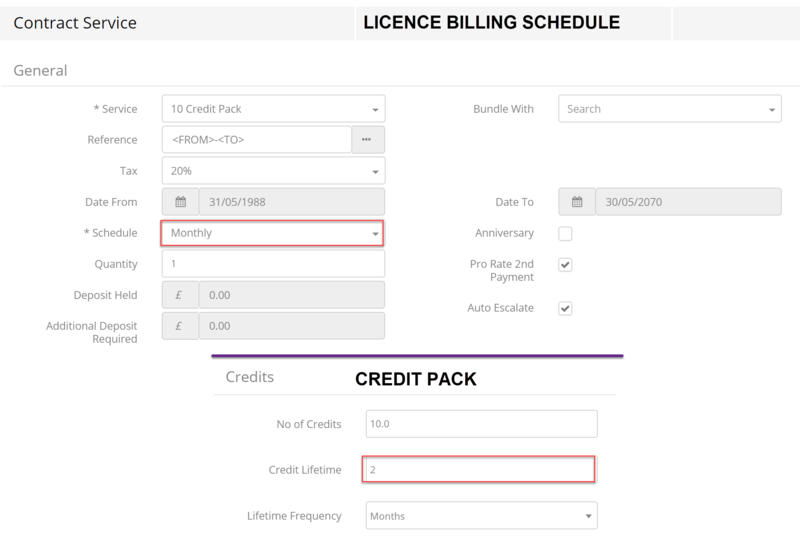 You can set up rolling credits by configuring the Credit Package (as shown above) with a lifetime that exceeds the Licence billing schedule. This way, credits will roll until their lifetime expiration. 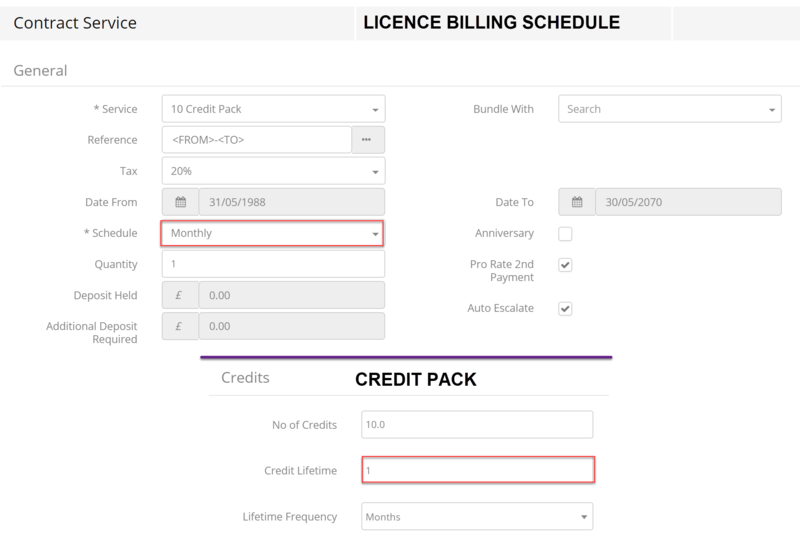 For example, if you would like to bill for credits monthly, but allow them to roll for another month, you can set the Licence billing schedule to Monthly, then set the Credit Package lifetime to 2 months. There is currently no possibility to limit how many credits can roll, but this can be kept in check using shorter lifetimes. Expiring credits will no longer be usable after the end of the billing period. To achieve this, the lifetime of the Credit Package will need to correspond to the frequency of allocation (the Licence Billing Schedule). So if you want to allocate credits per month, and have them expire after that month, then their lifetime should be set to one month too. No of Credits - The total number of credits allocated to the Account. Credits Remaining - The remaining number of credits, out of the current pack. Credits Used - The number of credits which have been used out of the current pack. If a Licence is auto-renewed, then this will extend the end date of the contracted service (the credit pack) and so the credit pack will extend with the Licence. Therefore, customers with credits allocated as part of a Licence will automatically continue receiving them according to the agreement. If you over allocate credits, please create a Credit Note using the Credit Pack as the credited product. Read more about creating Credit Notes. If you would like to switch an existing customer's payment method from Cash to Credits, all you need to do is go to Member > Accounts, edit the desired account and change their Client Type to one that uses credits. 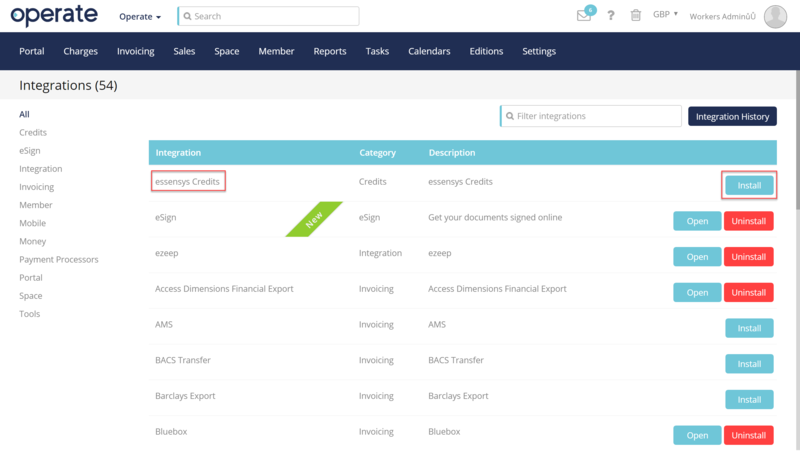 If you would like to switch all customers belonging to a specific Client Type, then yuou can simply set that Client Type to Credits, in the corresponding tab of the Credits configuration area, as shown above. Any associated Meeting Packages or Meeting Credits, Reservation or Product Discounts will be disabled as soon as you switch the client to credit payments. If you switch back to a Cash paying Client Type, then these discounts will resume if they are still within their set period and have not been removed from the Account record. You do not need to worry about removing any such associated packages or discounts, since they will simply not work with credits. If a customer who is switched to Credits already has bookings made, these will continue to be billed in cash. To bill them in credits, please cancel and rebook them. Please check your cancellation policies to make sure the customer is not billed twice. Please see Cancelling Bookings and Configuring Cancellation Policies for further information.